12/28/2010 – The Editor of Chess Notes has contributed over 80 articles to ChessBase, firstly Unsolved Chess Mysteries and then Chess Explorations. A handy A to Z has now been prepared, for ease of reference and as a reminder of the plethora of games, positions, exposés, quips, enigmas, photographs, quotes, compositions and quizzes presented in the two series. Edward Winter is the editor of Chess Notes, which was founded in January 1982 as "a forum for aficionados to discuss all matters relating to the Royal Pastime". 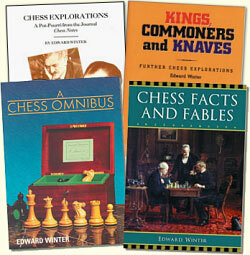 Since then, over 6,870 items have been published, and the series has resulted in four books by Winter: Chess Explorations (1996), Kings, Commoners and Knaves (1999), A Chess Omnibus (2003) and Chess Facts and Fables (2006). He is also the author of a monograph on Capablanca (1989).